In Everything I Know About Marketing I Learned from Google, digital marketing guru Aaron Goldman shares twenty Googley lessons from the world’s most ubiquitous brand to help you better engage your customers and prospects. And now you, too, can Google your business to build meaningful connections with more customers than ever! 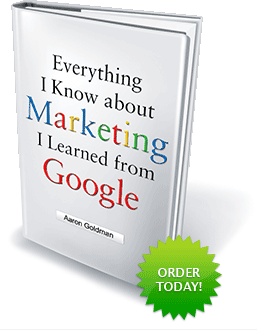 Order Aaron Goldman’s Google book today. NEW! Watch the book trailer and Google rap videos. NEWER! 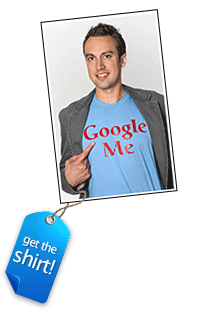 Join us on the Googley Lessons Blog Tour and see other Aaron Goldman speaking appearances. NEWEST! Check out the Googley Lessons eBook. ALWAYS NEW! The Googley Lessons blog has all the latest Google News and Digital Marketing Tips. 새로운, 新しい, 新, 新! See translated versions of the book in Korean, Japanese, Traditional Chinese and Simplified Chinese. EIKAMILFG and U can 2!